Topographic survey of 1100 hectares performed by aerial photogrammetry. Results obtained from 2600 aerial images taken by Artech Drone company. Post processing by Drones Imaging. 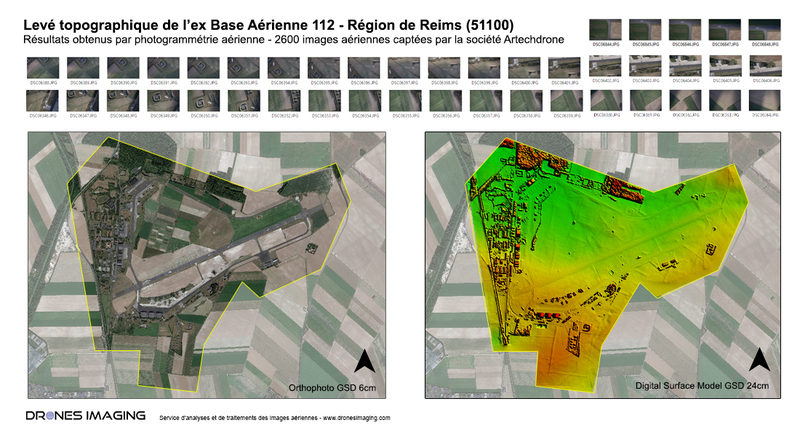 Orthophoto and Digital Surface Model carried out as part of the rehabilitation of the former Air Base 112. 1.5 hour flight (for datas acquisition part) and delivery of geospatial productions at day +2 (for post-processing part). Aerial Images Source : Artech Drone company. Orthophoto RVB : GSD 6cm. Dense cloud : 140 millions points.